Tropical dinner made easy, anytime –Love that! Tender and flavorful with little effort. Combine pineapple with juice, sugar, vinegar, soy sauce, curry powder, ginger, and red pepper flakes into slow cooker. 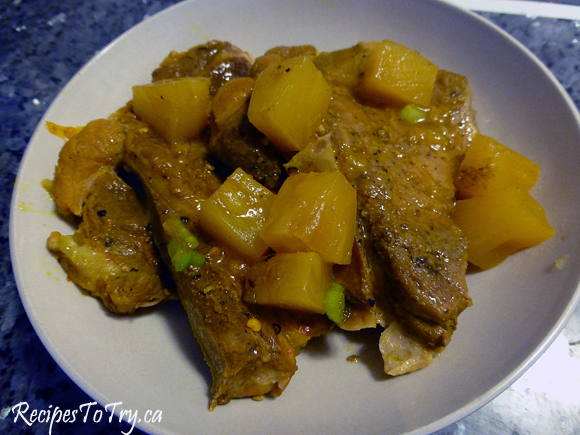 Season pork chops with salt and pepper and add to slow cooker. Cover and cook until pork is tender, 6 to 8 hours on LOW or 3 to 5 hours on HIGH. Remove pork chops to serving platter, cover loosely with foil, and let rest for 10 minutes. Meantime, skim fat from surface of juices left in the crockpot with a large spoon. Whisk water and cornstarch together in bowl. Transfer cooking juices to saucepan, add cornstarch mixture, and simmer until reduced to 2 cups - about 12 minutes. Stir in scallions and season with salt and pepper to taste. Spoon 1 cup sauce over chops and serve with remaining sauce.